It is not uncommon to have a blood test during pregnancy, especially if your doctor suspects you are developing high triglycerides. Though it is normal during pregnancy for cholesterol to be elevated, high triglycerides can result in complications. Staying as healthy as you can and taking up positive personal habits can help you control triglycerides during pregnancy. When you eat more calories than necessary, they are stored as triglycerides inside your body. These triglycerides are used when blood glucose, or energy for your cells, runs low. Triglycerides are liberated from fat storage and released into the blood for energy. When you are pregnant, your body is providing energy for both you and your growing baby. 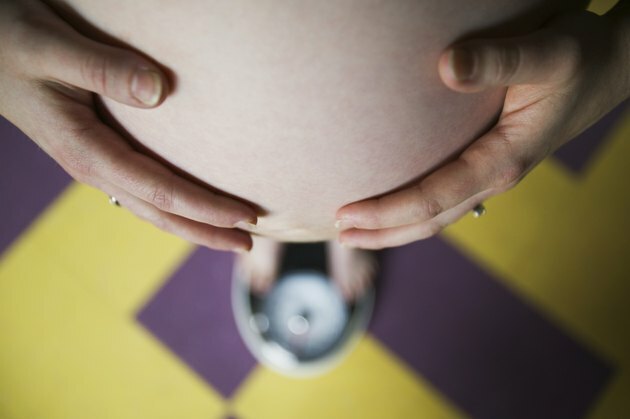 Your metabolism, the amount of calories you and your baby are using, increases. It is not uncommon that between meals, when calories are running low, triglycerides are needed for extra energy during pregnancy. Their release for use can cause high blood triglyceride levels. As of 2011, many of the same medications that treat high cholesterol are also used to treat high triglyceride levels. Most doctors agree that cholesterol medications should not be taken during pregnancy. In fact, even women who are breastfeeding should abstain from cholesterol medications. Statins, commonly prescribed medications for cholesterol and triglycerides, can get into a mother's milk. Since as of 2011 not much is known about the effect of statins on a growing baby, the consensus is to avoid them. Most cholesterol and triglyceride levels return to normal four weeks postpartum. Breastfeeding mothers may see a reduction in cholesterol levels even sooner. High blood triglycerides can be a cause or sign of further pregnancy complications, including gestational diabetes, which is impaired glucose clearance from the blood. A 2010 study in the "Canadian Medical Association Journal" found that pregnant women with high triglycerides during the first trimester are more likely to develop gestational diabetes than those with normal triglyceride levels. This is helpful because gestational diabetes takes maternal action to keep in check. Knowing you are at risk for gestational diabetes can keep you and your baby healthier during gestation. Another complication of high triglycerides during pregnancy is preeclampsia, a condition marked by an increase in blood pressure and decrease in kidney function. Having preeclampsia can mean a decrease in blood flow to the placenta, the main source of nutrients for your baby. It can also cause placental abruption, which occurs when the placenta releases from the uterus. This can cause internal bleeding and is dangerous for you and your baby. Preeclampsia can also cause seizures and cardiovascular disease in the mother. You may be able to prevent high triglycerides and their complications during pregnancy by choosing healthier habits. Try to control weight gain. Reduce your intake of fatty meats and dairy to keep saturated fat and cholesterol under control; they are the biggest contributors to fat and cholesterol in the diet. You can also add extra fiber to your diet. Fiber can help rid the body of cholesterol and block the absorption of triglycerides. Exercise is also beneficial during gestation, keeping pregnancy-related conditions at bay and reducing triglyceride and cholesterol levels. The March of Dimes recommends 30 minutes of aerobic exercise most days of the week. This can consist of walking, hiking or even swimming. Pick something you enjoy, is safe and will stick with. Speak with your doctor before starting any new diet and exercise program, especially during pregnancy.